We eat an obscene amount of tacos in this house– especially in summer. It’s just such a perfect time for them with all of the fresh ingredients so readily available for toppings. Plus, they’re super easy, which is wonderful considering there are so many things I usually want to be doing other than standing over my stove or grill. 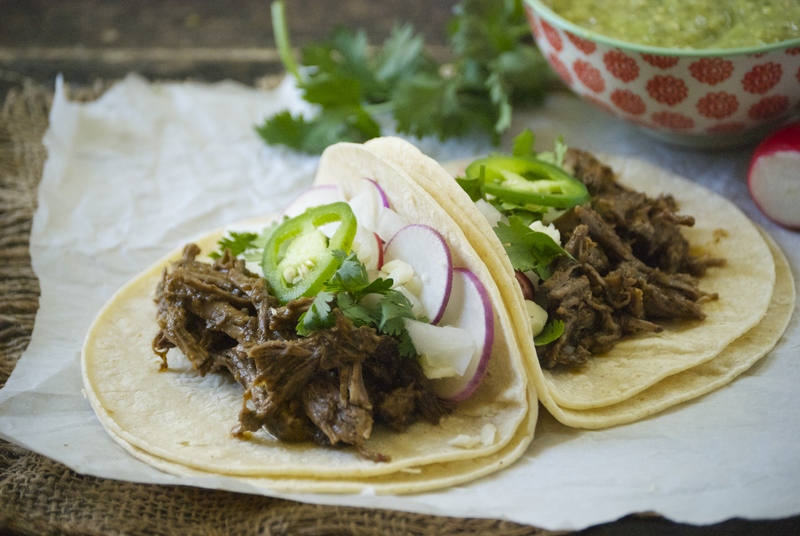 I’ve been searching for a perfect barbacoa recipe for awhile now. And by golly, I’ve found it! I’ve tried several that were fine, but not particularly memorable. That is, until I stumbled upon this one. I wanted something that was somewhat saucy, but more importantly had a nice tang to it. 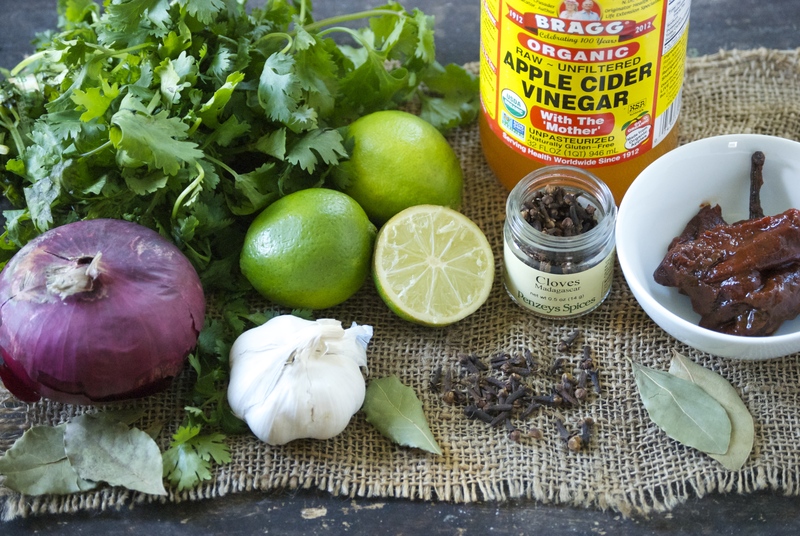 When I read this recipe, I immediately knew it had great potential– it contained both cider vinegar and lime juice. Bingo! It also had the freshness I was looking for with cilantro, garlic, and onions blended in to make a perfect sauce. A little intrigue from the addition of cloves and a bit of heat from the smokey chipotle peppers in adobo sauce confirmed that this was what I had been looking for. I knew I didn’t want to fire-up the oven long enough to cook five pounds of beef. My house would be a sauna at the end of it. Cooking overnight in the slow cooker was a perfect solution. It yielded a perfectly tender piece of beef that was perfectly, “tang-ily”, seasoned. Reducing the cooking liquid at the end really concentrated those flavors, too. 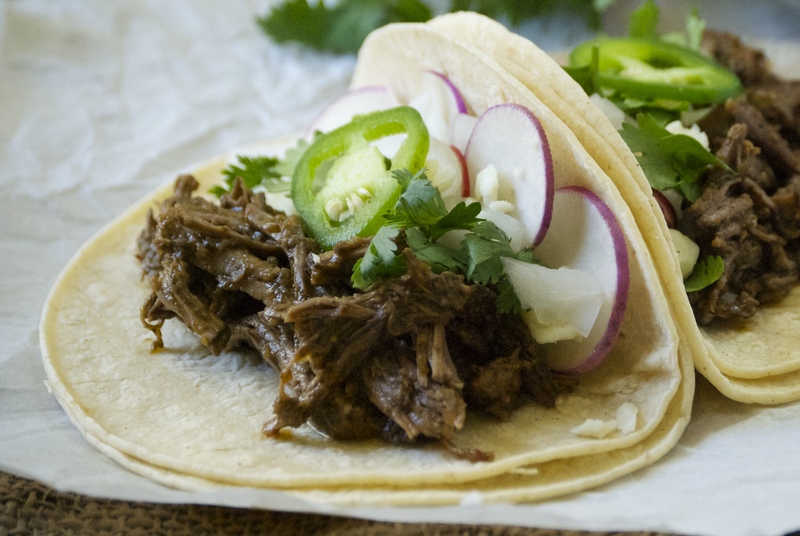 This barbacoa is perfect to feed a crowd of people, like we did, or make a big batch and freeze the leftovers for quick, delicious weeknight meals. I finally caved-in a bought a tortilla press and have happily been perfecting my corn-tortilla skills– more on that later. But, for now– feel free to make these tortillas and drink this margarita for your taco party. 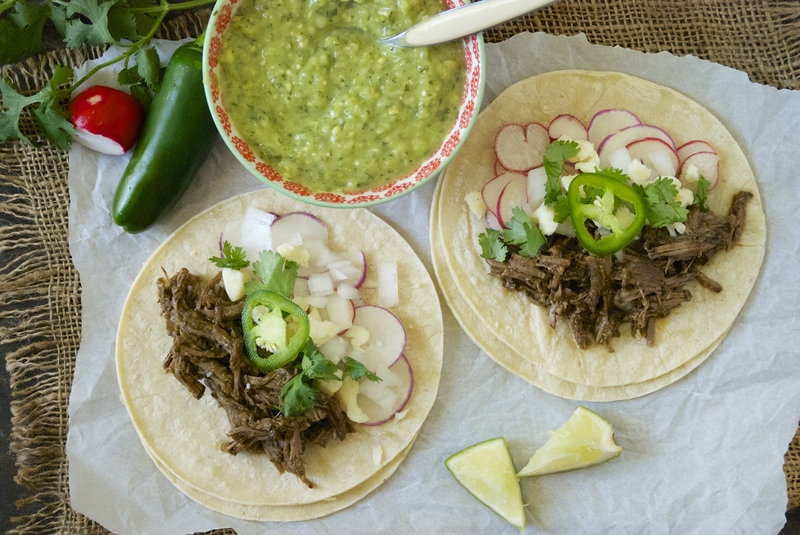 Oh, and for variety– here’s a wonderful carnitas recipe! You’ll be inviting me over, right? Adiós, muchachos! Use this recipe and add 1 avocado. Blend everything together. Cover and keep in the refrigerator. Place the beef in a large slow cooker, my oval one worked perfectly. You can use 1 piece of meat, or cut what you have into a few pieces so it fits properly and so it cooks uniformly. To a food processor add the following ingredients (or chop everything very finely using a knife): cilantro, onion, garlic, chipotle peppers and their sauce, lime juice, cider vinegar, ground cloves, salt, and pepper. Pour the mixture over the beef and add enough broth to cover the meat. Add the bay leaves. Stir the sauce and broth together and cover with the lid. Turn the sow cooker onto the “low” setting and cook for 8-10 hours. The beef will be completely tender and shred easily with a fork when it’s done. If your beef doesn’t appear this way when you feel that it’s done–cook it longer. The collagen will eventually break down and yield a tender piece of meat. Remember, every slow cooker cooks a bit differently. When the beef is done, remove it from the liquid and shred it with two forks (removing any fat, too). Place the liquid into a large sauce pan and heat uncovered until the liquid has reduced by about half or more (feel free to skim any fat off, too). Use your best judgement, you will be pouring this mixture over the shredded meat, so it depends upon how much liquid you prefer in your barbacoa. Combine the sauce and beef together in the slow cooker. Use it to make tacos! Serve it with tortillas, queso fresco or coitja cheese, radishes, cilantro, onions, jalapenos, limes, and the Avocado Tomatillo Salsa. The barbacoa reheats and freezes very well. Enjoy! I’m so glad you posted the recipe for this – I was drooling when I saw your picture on instagram! Thanks Kathryn! It’s a great recipe– hope you give it a try. Happy weekend to you! Wow, this looks absolutely amazing!